Social networking may have started out as a way for students to keep track of their friends, but it has expanded in just about every direction. These days, you can find at least one related social networking site on just about any general topic, including music, photography, television, books, shopping, and bookmarking. But it isn’t all fun games. Job sites like Monster and LinkedIn began the evolution from social networking to professional networking, and academia has joined the fray as a number of networking sites specifically for academics have popped up in recent years. Now we can add “research” to the list above. – It shows academics around the world structured in a ‘tree’ format, displayed according to their departmental and institutional affiliations. – It enables academics to see news on the latest research in their area – the latest people, papers and talks. We are hoping that Academia.edu will eventually list every academic in the world — Faculty Members, Post-Docs, Graduate Students, and Independent Researchers. 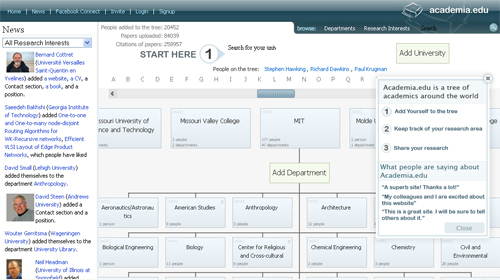 Academics can add their departments, and themselves, to the tree by clicking on the boxes. The message concludes with the names of a few notables who have joined (or been added) to the site, and a request to assist Dr. Price and friends in their efforts by further circulating the announcement. Call me a sucker, but I got that message and immediately joined up, forwarded it to my colleagues, and started envisioning the possibilities. What intrigues me is Academia.edu’s combination of a professional networking site with a digital repository. Could this take the place of our nascent institutional repository or save my fellow librarians from having to put together an institutional bibliography each year? A screen shot of Academia.edu’s homepage. The networking-repository hybrid model was new to me, though I learned later that Academia.edu is not the first to do this. Nor is it the only virtual platform where researchers can create a profile and search for others with similar research interests. A lot of people in academia already use Facebook and LinkedIn to connect with their colleagues and friends, but Academia.edu and its competitors are different because they were specifically created to serve the needs of academics, in terms of research, professional networking, listing citations, and file sharing. Try some of those activities on Facebook, and you’ll soon agree that it falls far short of an academic’s networking needs. 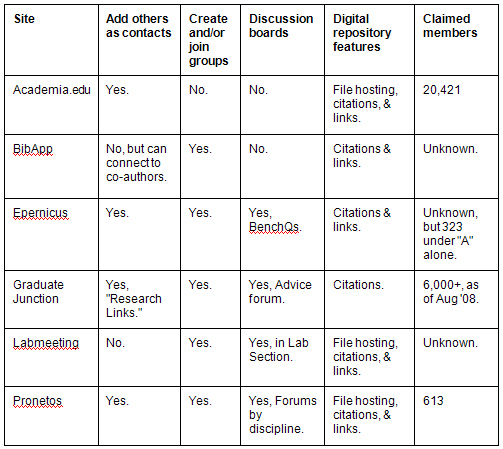 Here’s an overview of the major academic networking sites and their features (if you know of others I overlooked, please comment below). All allow you to create a profile and search for other academics by research interest, so I’ve omitted those features in the table. In addition to the characteristics above, these are the qualities that make each site unique. Academia.edu: Networking for academics in all fields. Offers unique visual format with organization by institution. Features Facebook Connect. BibApp: Must be hosted on your server for campus-specific organization of faculty experts and research. Functions more like a catalog of faculty than a networking site, but could be used either way. Epernicus: Networking targeted for scientists. Features “BenchQs,” which is like Yahoo! Answers for science. Graduate Junction: Networking for graduate students that professes to be less intimidating than professional sites. Offers a conference diary & job listings. Labmeeting: Networking for scientists in the biomedical and related sciences. Offers features to assist in organizing and sharing information in lab settings. Also includes strong privacy protection. Pronetos: Networking for academics in all fields. Organization by discipline, and offers discussion forums for each discipline. I’m going to use the remainder of this post to critically review these academic networking sites, looking at the benefits, limitations, and possible future outlook. The ability to locate other scholars with similar research interests. The power to upload papers, articles, and even books to contribute to a worldwide digital repository. As far as #1, the networking aspect goes, it would be natural to ask why any of these sites are an improvement over the ubiquitous Facebook. Who needs another social network, for goodness sake? Vivek Murthy, one of the founders of Epernicus, addressed the question in a post on the Epernicus blog: “Mikhail and I started Epernicus because we realized that the social networks to which we belonged weren’t able to serve our needs as scientists. The profiles didn’t capture what was important to scientists. And equally as important, we couldn’t use these networks to help us find expertise in real world scientific networks.” If they had a question or issue unique to their research that no one they knew personally could address, they wanted a way to find others out there who might know more. This is not what Facebook was built for. In theory, the opportunity to share research interests and connect with other scholars sounds idyllic. Finally, the chance to find out who’s walking the same path and reading the same articles. It’s like eHarmony for the brain instead of the heart. If there is a need and a demand for such a thing, it could really take off. Personally, I get more excited about #2, the digital repository side of this project. The sites that actually host files, especially Academia.edu and Pronetos, are contributing to the open access movement in ways they may not even realize. Although those of us in libraries already know that faculty usually don’t want to take the additional time to post their papers to our repositories, these two sites could be different because (a) they’re easier to use than any library repository I’ve ever seen, (b) they’re prettier, and (c) they make it clear that the papers uploaded will be shared with others instead of stored in a dusty server room, never to be heard from again. First, any social networking site, whether personal or professional, is only as good as its membership. With that in mind, I would say that all of these sites have a long way to go in soliciting members. Academia.edu appears to be the largest, at about 20,000, but this is still a small percentage of academics worldwide. GraduateJunction may have the greatest potential in this arena due to its specific target audience (graduate students) and the fact that it boasts more “useful” (job and conference) features than the other sites in this review. Second, although I initially found it entertaining to search for others with similar research interests to mine, once I found a few I realized that I just didn’t know what to do with them. I could add them as contacts and review their publications. What then? If I were extremely motivated perhaps I would email them and say a few words in our unique research interest language (“speaking geek,” I think they call it). But how often would such contact lead to something constructive? The more I searched, the more skeptical I became. Third, academic networking sites are facing big challenges in finding an effective way to ensure that only legitimate academics participate. The UK Times Higher Education expressed concern about Academia.edu because “anyone can pass themselves off as an academic…and scholars could be misled into putting their details on it because it occupies the generic top-level domain ‘.edu,’ which is normally reserved for universities.” On the other hand, some sites are so careful to screen members that they seem almost impossible to join. Despite repeated attempts, I was unable to join Labmeeting or Pronetos due to their screening standards. Pronetos sent me an activation message that somehow disappeared into cyberspace (and no, it wasn’t in my spam folder), while Labmeeting did not recognize my university email address as being from a legitimate academic domain (my university president would take issue with that!). All in all, social networks of any variety are a curious tradeoff. How much time are you willing to put into them in order to expand your web of connections? In writing this blog post, I spent 8-10 hours crawling around on the various sites mentioned here, creating profiles, exploring group and research interests, checking to see if I knew anyone (or wanted to know anyone) on any of the sites. I found many of the sites appealing at first, and enjoyed some of my wanderings. But now that I’ve had some exposure to these platforms, returning to Facebook feels kind of like going home. True, I can’t search for other scholars based on my research interests. But considering how many other avenues I have to find them — from publications to blogs to conferences — do I really need a new one? As Jeffrey R. Young noted in “New Social Network Hopes to Catalog All Researchers and Their Interests,”an article in the September 16 issue of the Chronicle of Higher Education, “It’s too soon to tell whether any of these sites will catch on, and it seems that the services will only become valuable if a critical mass of researchers join in. The final winner may be Facebook itself.” So, are these new-kid-on-the-block academic networking sites worth your time? Based upon my admittedly limited experience on these sites, probably not. But if you have some free time, go for it. Create your profile and see who else is out there. You might get lucky. Many thanks to Brett Bonfield and Ellie Dworak for taking the time to offer feedback on the draft of this post, and to Brett for his coding kindnesses. I’m interested to see you mention Facebook Connect in connection to Academia.edu, though I don’t see a Facebook login option on the site. The inclusion of FB Connect might address the issue with “I’ve found colleagues, now what?” issue which was my first response after signing up for the site. If I could find those colleagues and then easily (ie automatically) friend them in FB, then the social aspect could be increased. Seeing articles that have been put into the archive in Academia.edu then appear in my FB news feed would also be a by-product that might encourage archiving. That’s a good way to promote your work to colleagues. These cross-site options (also see Google’s Friend Connect, released for public use the same day as FB Connect) are where the real action will be happening. By connection our niche networks to the greater networks, we can, hopefully, have the best of both worlds. I’m excited by these options because I’ve reached the overload point on social networks, logins, separate friends, and all that. The danger, of course, being the further entrenchment of power by FB and/or Google (though in Google’s defense their are at least using open standards like OpenID and OAuth). thanks for this post. I would like to add Mendeley (www.mendeley.com, I’m a co-founder). Mendeley is two things: Free academic desktop software (available for Windows, Mac and Linux) for managing & sharing research papers, and a website where you can back up and access your research papers, discover research trends, and connect to like-minded researchers. Mendeley went into public beta in August 2008 and is funded by former key personnel from Last.fm, Skype, and academics at Cambridge and Johns Hopkins University. I hope you find that interesting. If you want, you can add further ideas or comments in our feedback forum: htto://feedback.mendeley.com. I’m having trouble keeping up with social networking sites. Recently I deleted my Myspace account, my Friendster account, and I should probably go delete my Tribe account if I can remember what the login is. While I know that new sites with a professional twist are supposed to help in our world, I fear that the same thing will happen with these sites. One will take over (like Facebook has) probably because it has the most user-centered interface. Plus, when we get into the world of web-hosted systems that are not our own (on our institution’s server) for scholarly communication, repositories, etc, we run into copyright and intellectual property issues. Did you look into what these two sites have when it comes to policies? Just how aware will researchers and academicians who use such sites be when it comes to these issues? You might also like to have a look at Nature Network, the platform of Nature Publishing Group (disclaimer: I work for the same company as an editor at the journal Nature, but do not work for Nature Network). This is a social website that lets scientists (or anyone, but the accent is on science) join for free and create a profile of their publications and other informal material. People can form groups and there are about 50-100 scientists who blog there. There are events listings, and other aspects. http://network.nature.com. Nice post! This is a bit of a different animal, but there are also fee-based academic networking sites such as COS (Community of Science). ProQuest bought COS & CSA and has big plans to integrate it’s Expertise database (where scholars load their own profiles, and where ProQuest will be loading researched profiles) with it’s article indices, funding opportunities, and conference calls all into one suite of products. So one could find collaborators online, see what they have published (or see who is publishing in an area and then visit their profile), and then find funding opportunities and calls for papers all in one search. Chris Blanchard CEO, Pronetos, Inc.
Kim: Thanks for blogging about our site, Pronetos. We hope it is a useful addition to the scholarly world. We created the site because we heard plenty of scholars say that they did not want to use FB and MySpace because they weren’t professional oriented. So we created a site that is exclusive to academics. We think it is a great way for people to create their own easy to maintain home page on the web. It is also sorted by community so that you can find others in your field. In our opinion FB and MySpace are fairly difficult to navigate to find other people with like interests. The site is still being built out and we are adding new communication tools (improving the e-mail) and adding more security measures like CAPTCHA. We are also beta testing an OAI-PMH compliant repository called the Global Research Archive. That site serves as a traditional repository which serves all disciplines. We worked very closely with the developers of that software to insure that we had the most complete set of policies of any repository host out there. There are few repositories listed in Open DOAR that have their policies as well articulated as does the Global Research Archive. For scholars we know that content is currency, thus we take the ownership issue very seriously. We are also firmly committed to the Open Access and Open Source communities. So, we hope that scholars the world around who see eye-to-eye on these issues will help support us. As always, we are easy to get in touch with and we always strive to be responsive to the needs of the communities we serve. Thanks again for posting about us! Thanks for the post: this is something I’ve also been thinking about in the last months. Just wanted to share my own list, now updated with the references of yours, Jan and Maxine. Judging by the version number it seems that it is in early stages but having a short play with it really seems a one stop shop for the whole academic journey. Though it is not 100% academic targeted it still has a dedicated section to that. It even acts as a publication repository. Will watch it with interest. Thanks a lot for the list, this is exactly what I was looking for. You should also check Sciyo – http://sciyo.com – it’s an open access scientific platform with over 10 000 users, all of them have their own profile, can add each other as colleagues, share their videos, documents and other works. Quartzy (http://www.quartzy.com) is based on a network for scientists, BUT it actually helps you with day-to-day life in the lab. Very cool site. I am the co-founder of a start-up, Quartzy (https://www.quartzy.com) that you and your readers might find useful. Basically Quartzy is a network of scientists AND the things that they love: chemicals, reagents, protocols, and facilities! :) Think of it as a three-way network. Scientists upload their inventories and network them with their lab-mates to create a lab inventory on the fly. They can now share chemicals, comments for the chemicals that they use, place orders with their lab manager, see who has ordered what in the past and more! The software is all online so there is nothing to install. Quartzy has been up for more than a year and has thousands of scientists logging to manage their inventories, schedule appointments on shared facilities and more. I would be happy to talk to you more about Quartzy if you find it interesting!